Husband, 2 year old & crazy dog are sound asleep. 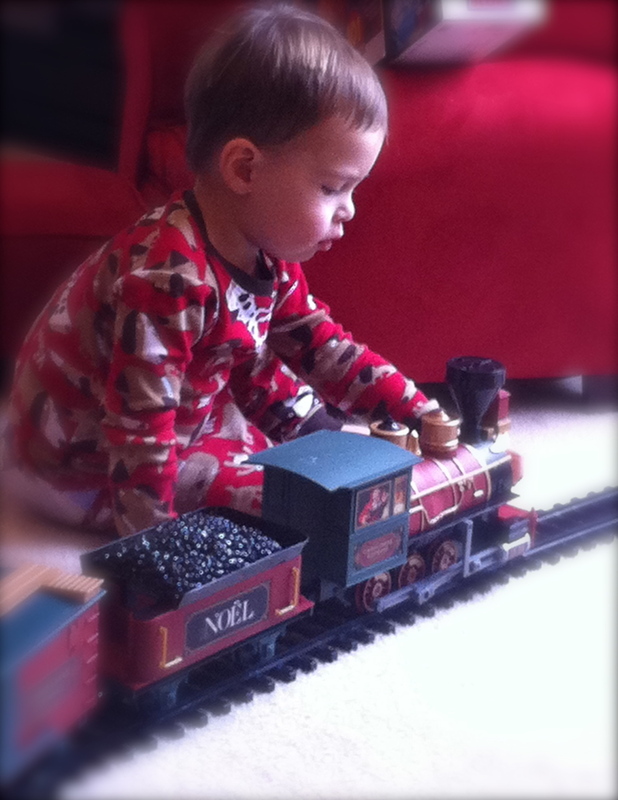 The fire is lit...the tree is twinkling..and the train is quietly sitting on the track. I can't help but find myself feeling an ever present feeling of gratitude. My sweet little boy did everything I thought he would. He came down the stairs Christmas morning and was beyond thrilled that Santa remembered him and delivered him what he had asked for. He's really starting to say things that makes total sense. I really wish I could box up all these little things and keep them forever. Tonite I asked him if he wanted something to drink...his response? In the cutest, little man voice I've ever heard. Just a few weeks ago..he started really responding to me when I say "I love you." He says "I love you too, Mommy." This holiday came so fast. Ya..to think about it, 2010 WENT so fast! We didn't visit family. Or leave our house even. We spent the time together. I cooked dinner Christmas Eve...and brunch Christmas Day. "BELIEVE in the magic of Christmas." Thank you dear Lord...for the magic of life.